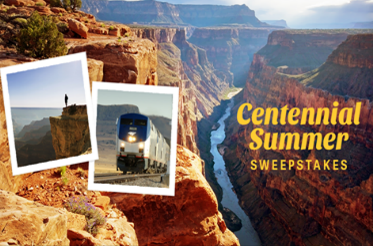 National Parks Centennial Summer Sweepstakes – Win a trip for 2 from Chicago to the Grand Canyon! Win a train trip for two from Chicago to the Grand Canyon! ENTER SWEEPSTAKES HERE – National Parks Sweepstakes page. ELIGIBILITY – Sweepstakes is open to legal residents of the 50 United States and D.C., who are eighteen (18) years of age or older at the time of entry. SWEEPSTAKES ENTRY PERIOD – The Sweepstakes begins on July 6, 2016 at 12:00:00 p.m. noon Eastern Time (“ET”) and ends on August 1, 2016 at 5:00:00 p.m. ET. PRIZES – Prize winner will receive a 6-day train trip for two (winner and guest) from Chicago to the Grand Canyon through Amtrak® Vacations. Prize also includes a $1,000 Southwest Airlines gift card intended to be used towards air transportation to/from Chicago, IL and two (2) America the Beautiful National Parks and Federal Recreational Lands passes (together, with the Amtrak train trip, the “Prize”). Approximate retail value of Prize: $3,198. Gift card is subject to the terms and conditions imposed by the issuer. Trips valid through the 2017 season. 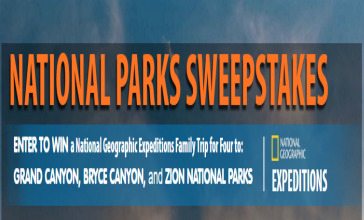 National Geographic National Parks Sweepstakes – Win a trip to the Grand Canyon & more! 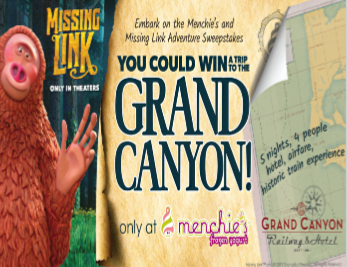 Win a trip to the Grand Canyon & more! ENTER SWEEPSTAKES HERE – National Geographic Sweepstakes page. ENTRY LIMIT – Limit one (1) entry per person, family or household. ELIGIBILITY – Only legal residents of the fifty (50) United States and the District of Columbia, and residents of Canada (excluding Quebec) who are eighteen (18) years of age or older at the time of entry are eligible to enter. SWEEPSTAKES ENTRY PERIOD – The National Geographic National Parks Sweepstakes begins on or about April 6, 2016 at 12:01 a.m. Eastern Time (“ET”) and ends on August 31, 2016 at 11:59 p.m. ET. PRIZES – One (1) grand prize is available. The Grand Prize consists of an eight day National Geographic Expeditions Family Adventure for four (the winner, plus one adult companion (must be at least 18 years old), and two children (under age 18); or winner may elect to bring three children) to Grand Canyon National Park, Arizona, Bryce Canyon National Park, Utah, and Zion National Park, Utah on one of the available tour dates in 2017 (“Grand Prize”). The trip consists of the following: round-trip economy class air transportation from the major commercial airport nearest the Grand Prize Winner’s primary residence to St. George, Utah, double occupancy standard hotel accommodations for 7 nights and some meals and tours are included. The approximate retail value (“ARV”) of the prize is Twenty Five Thousand Dollars ($25,000.00). Thomas’ English Muffins and Bagels “135 Toasts to Mom” Sweepstakes & IWG – Win a trip to the Grand Canyon! ENTER SWEEPSTAKES HERE – Thomas English Muffins Facebook page. ENTRY LIMIT – Limit of one (1) instant win game play per email address and one (1) Grand Prize entry per Daily Period. ELIGIBILITY – The Promotion is open to legal residents of the fifty (50) United States and the District of Columbia, 18 years of age and older. 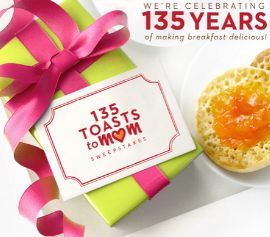 SWEEPSTAKES PERIOD – Thomas’ English Muffins and Bagels “135 Toasts to Mom” Promotion begins at 12:00 a.m. Eastern Time (“ET”) on April 6, 2015 and ends at 11:59 p.m. ET on May 10, 2015. PRIZES – Sweepstakes Grand Trip Prize (1): A trip for winner and up to three (3) guests to the Grand Canyon National Park. Trip includes round trip coach-class air transportation for winner and up to three (3) guests to Sedona, AZ, standard hotel accommodations for four (4) (two (2) rooms, two guests per room) for three (3) days / two (2) nights, and one (1) rental car. Trip includes a Thomas’ English Muffins and Bagels private Breakfast for winner and guests, a guided tour of the Grand Canyon and $300 for winner only (awarded in the form of a prepaid gift card) which may be used towards food expenses while on trip. Approximate Retail Value (“ARV”) of the Grand Prize: $7,500. Cracker Barrel Old Country Store Summer Stories Sweepstakes – Win a vacation to Walt Disney World or other great destinations! Win a vacation package worth $7,500 (choose from Walt Disney World, Albuquerque, Washington D.C., San Antonio, Nashville or the Grand Canyon)! ENTRY LIMIT – Limit of 381 Sweepstakes Entries per person, per email address during the Promotion Period regardless of method of entry. ELIGIBILITY – The Cracker Barrel Old Country Store™ “Summer Stories Sweepstakes” is open only to legal residents of the fifty (50) United States (including District of Columbia) over the age of majority at time of entry in their jurisdiction of residence. SWEEPSTAKES PERIOD – The Promotion begins on June 30, 2014 at 8:00 a.m. Central Time (“CT”) and ends on August 28, 2014 at 10:00 p.m. CT.